Percy Jackson discovers that he’s a demigod (half human, half Greek god) and goes off to live and train at Camp Half-Blood. After being accused of having stolen Zeus’s lightning bolt, he has to go on a quest to prove his innocence to the rest of the gods to prevent a war between the gods. You know, just every day stuff. And you shall fail to save what matters most, in the end. On a class trip to a museum, Percy’s math teacher turns out to be a monster, which is kind of a shock to him. Luckily his friend and protector Grover (actually a satyr) and teacher Mr Brunner (actually a centaur named Chiron) save him. Grover and Percy’s mother bring him to Camp Half-Blood. On the way, Percy’s mother is taken and Percy fights the Minotaur (the one from King Minos’s labyrinth). Because, you know, mythical creatures still exist. At Camp Half-Blood, Percy discovers that he’s the son of Poseidon and meets his fellow campers, including Annabeth (the daughter of Athena and super smart.) and Luke (the son of Hermes). 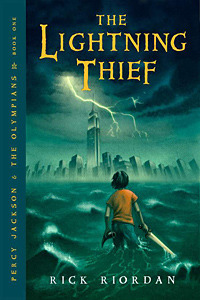 THEN Zeus’s lightning bolt gets stolen and Percy is being accused because Zeus thinks that Poseidon wants to take over power by involving his son. Now Percy needs to prove his innocence and clear his father’s name. Percy goes on a quest with Annabeth and Grover and has to find the lightning bolt before summer solstice, when the gods come together. Since he’s certain that Hades’s is the one who actually stole the bolt, they head over to L.A., where the Underworld is. On the way, they encounter several monsters such as the Furies (Percy’s maths teachers Mrs Dodds is one of them), Medusa (they decapitate her) and Echidna (with her monster dog the Chimera, who Percy escapes by jumping of a tower into the water). They also meet Ares, who tells Percy his mother is still alive and being hold hostage by Hades. Ares also gives him a backpack. When they finally get to the Underworld, Hades accuses Percy of having stolen his Helm of Darkness (because, you know, apparently Percy steals everything). It turns out that the lightning bolt is, in fact, in the backpack that Ares gave to Percy, and they have to flee from the Underworld before Percy has a chance to save his mother. Percy fights Ares, who is the one who stole Hades’s Helm of Darkness, beats him and retrieves the helm. Then Percy has to get the hell back to New York and to Olympus, which is, of course, on top of the Empire State Building. He returns the bolt to Zeus, the helm to Hades and is cleared of all accusations. Percy gets back to Camp Half-Blood, after having returned the lightning bolt, to spend the rest of his summer in peace. Not. Because then Luke admits to Percy that he was the one who stole the lightning bolt, and that he did it for Kronos, king of the Titans, to cause a war between the gods. After this revelation, he summons a poisonous scorpion which nearly kills Percy. Percy is saved by Chiron and goes back to live with his mother in New York. Grover goes on a quest to save the long lost nature god Pan, the hero of all satyrs. Fury: Three monsters that serve Hades. Percy’s maths teacher, Mrs Dodds, is one of them.